Hi guys, it's been a bit of a roller-coaster week here! You know the kind - up and down and kinda difficult to catch your breath kinda week! Thanks to our SDS (Self Directed Support), Coo and I managed a respite night away at the theatre in Glasgow! woo hoo! We went to... 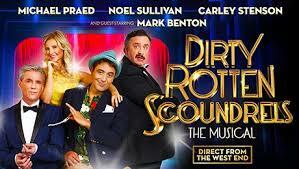 Dirty Rotten Scoundrels! The life of a Carer sure is a roller-coaster ride at times, a lovely night away, a giggle eating ice-cream in the theatre and then back to earth with a bump! Coo's seizures have worsened, he's so very tired and tetchy shall we say! We're ok, I've dug out my hard hat and we'll get his bloods done, sit it out for a bit and just see what happens...again! I'm glad I completed that 'Mindfulness' training TACT - (The Ayrshire Community Trust) recently offered free - it's come in handy over the last few weeks. I didn't think I needed this training as I'm usually kinda upbeat about things in general and cope pretty well but it's taught me to care a little more about me too and be a little kinder to myself and I guess that's a good thing to learn! I bet a lot of Carers could really use 'Mindfulness' training too!